The long awaited real-time biosurveillance program pilot project officially began on 11-July-2008. LIRNEasia received a grant from the International Development Research Center to conduct the developmental research project over the next 2 years. I will be working in the capacity of the Project Director. The first year will be spent on developing the ICT system for disease surveillance and notification. 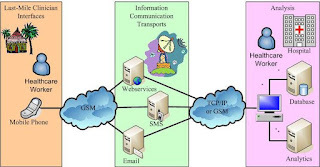 Data will be collected through a J2ME mobile phone application, which would be a direct adoption of the java rosa (a.k.a openROSA) suite of applications or a rendition of it. The analytics algorithms with GUI for detection of disease outbreaks will come from Auton Lab. Very well use Sahana Messaging or SMS Geo-Chats for a feedback/follow-up mechanism with a log for sending and keeping track of alerts. Second year will be devoted to evaluating the ICT system in a real world setting where the government and community health care workers will use the system as part of their daily routines. A prominent question will be determining the incentives for health care workers in rural settings to participate in a e-Health based programs. We will look at the productivity increase, which will be weighted against a control group who is not exposed to the e-Health based disease surveillance and notification program. Justify issues related some prior studies that have shown effects of manipulation of data - under-reporting or over-reporting - depending on the circumstance. Evaluate the effectiveness of biosurveillance algorithms in detecting disease outbreaks and understanding whether mobile application based data streams can assist in the detection and notification process; as well as the different aspects between the different sides (data collectors, algorithm designers, algorithm implementers, health monitors, program evaluators, etc) in the overall picture. Some of the initiatives in the same disease surveillance and notification space are the following projects -- Google Predict & Prevent, InSTEDD, Sahana, D-Tree, Dimagi, GATHER, among many others.